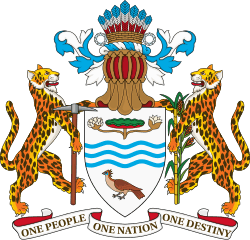 "One people, one nation, one destiny"
The Commonwealth realm of Guyana, officially known as "Guyana", was a predecessor to the modern-day Guyana and an independent state that existed between 26 May 1966 and 23 February 1970. Elizabeth II did not reside in or visit Guyana during its time as a Commonwealth realm. 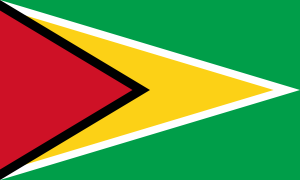 The Republic of Guyana came into existence on 23 February 1970, when Guyana became a republic within the Commonwealth. Forbes Burnham held office as prime minister (and head of government) of Guyana during this period. Following the abolition of the monarchy, former Governor-General Sir Edward Luckhoo provisionally became the first President of Guyana. ↑ "Guyana Independence Act 1966". Legislation.gov.uk. Retrieved 26 May 2013. 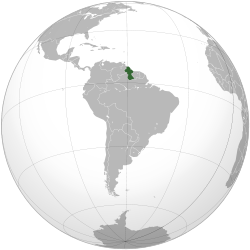 ↑ "Guyana Republic Act 1970". Legislation.gov.uk. Retrieved 26 May 2013. 1 2 "Guyana Republic Bill". TheyWorkForYou.com. Retrieved 26 May 2013. 1 Dominion, became republic before adoption of the term "realm"
3 Rhodesia unilaterally declared independence as a realm in 1965, but this was not recognised internationally. Declared itself a republic in 1970. This article is issued from Wikipedia - version of the 3/14/2016. The text is available under the Creative Commons Attribution/Share Alike but additional terms may apply for the media files.